The humanitarian crisis in Yemen is getting worse due to famine and the increasing displacement of people. The United Nations High Commissioner for Refugees (UNHCR) and other agencies have issued urgent calls to rescue Yemenis who are facing multiple crises, including armed conflict, displacement, the risk of famine and the outbreaks of diseases including cholera – creating the world’s worst humanitarian crisis and the worst mass starvation in Yemen’s history. The distribution of food in the Al-Hudaydah seaport area has failed because rebels who control the area divert the aid to other areas despite the fact that the Al-Hudaydah governorate has the most extreme hunger rate of all Yemeni governorates. It is time to implement alternative strategies for delivering aid to these desperate people. 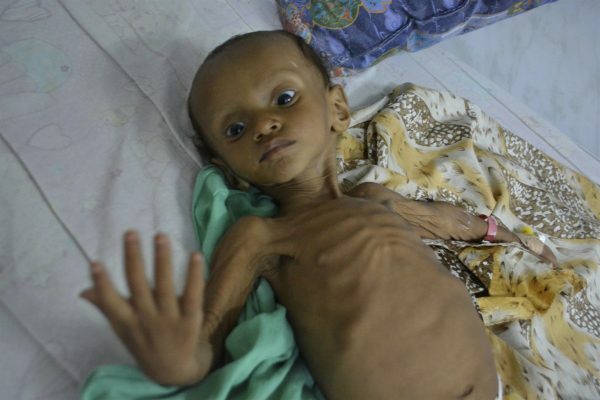 The majority of the population in Yemen are suffering from lack of food. Recent reports from the UNCHR noted that over 22 million Yemeni need humanitarian assistance. With this rate of hunger among the majority of the nation, the Internally Displaced Persons (IDPs) issue is definitely getting worse. IDPs face extreme poverty and lack of employment as insurgents sell the aid provided by international agencies on the black market. The impact of corruption on the distribution of aid and the use of aid for war purposes were obvious in areas captured by the insurgents despite an acute need for food among 75% of identified IDP locations and 51% of returnee locations. According to local relief organizations, such as the Al-Khair Coalition for Relief, most of the returnees returned to government-controlled land. Hudaydah and Taiz governorates are still subject to the Houthis’ siege. Hudaydah has the country’s main seaport on the Red Sea, and the majority of the aid comes to this seaport. However, Houthis deliver the aid to their battlefronts to continue their hostile aggression against the Yemeni nation. As a result of Hadi government efforts and the Arab coalition intervention, IDP from liberated lands such as Aden, Marib, Abyn, and Mocha have already returned as the UNHCR-IOM reported, but people in the governorates that are still ruled by the rebels are still being displacing from there to the liberated areas. The Marib governorate’s population quadrupled according to Yemen government reports, so the additional displacement will put heavy pressure on the Marib authority, which represents Hadi and legitimate government authority. However, the international, regional, and local relief organizations—the King Salman Humanitarian Relief Center, the World Food Programme (WFP), the United Nations Office for the Coordination of Humanitarian Affairs (OCHA), the World Health Organization (WHO), UNCHR, the Red Crescent Society of the United Arab Emirates (RCUAE), the Kuwaiti Joint Relief Committee (KJRC) and Qatar Charity – reach IDP in Aden, Marib and other liberated areas easily. Delivering aid through one port, the Al-Hudaydah seaport, in the current situation only provides additional support for the rebels, who continue to blackmail the Yemenis in regard to their food. As many reports have shown, the Houthis use aid to recruit more fighters and to supply their battle fronts, which means that the crisis will not end, and the aid will still be withheld from the desperately poor people who need it. The best method to treat this crisis is to deliver aid to alternative seaports to reach wider areas in Yemen. Using alternative ports would ease the delivery of aid to the IDP and other people in need. The aid would stay out of the Houthis’ control and reach the maximum number of people who need it. This would reduce the importance of the Al-Hudaydah seaport, and the seaport would be of less importance in the rebels’ calculations. This would lead the government and the rebels to reduce or freeze their military actions in the area. All of this would allow the aid to flow overland to the poorest governorates, including Al-Hudaydah itself. The main drawback to this strategy is the increase in the cost of transporting the aid if it comes through Mukalla or Aden, but the cost would not increase if the aid intended for the western and central northern areas of Yemen come through Mokha. The international community’s humanitarian policy does not take into consideration the contradictions of donor countries militarily attacking Yemenis’ infrastructure, effectively worsening the crisis they attempt to address. The two leading parties in conflict – Saudi Arabia and the United Arab Emirates (UAE) are top Yemen’s humanitarian donors. However, the Saudi-led coalition has blocked the ports and borders, resulting in food and medical shortages. The absence of political will to end the conflict and the conflict of interests amongst the donors, hinder the humanitarian crisis in Yemen, putting Yemenis lives at a greater risk. Although it is difficult to develop and implement a humanitarian policy in a state with little infrastructure such as Yemen, the problem lies in the hands of the international community, the humanitarian agencies and donors that do not work together to find a solution. Ali Balobaid, an aluminum of Seton Hall School of Diplomacy and International Relations and an Adviser at the Permanent Mission of the Republic of Yemen to the United Nations, was responsible for collecting data and research for this blog. The time frame was between March and April 2017, resulting in a policy memo written by Balobaid in April of 2017. This blog post was updated and written by Patricia Zanini Graca. Patricia is a second-year graduate student at Seton Hall’s School of Diplomacy and International Relations. Patricia graduated in Business Administration and she holds an MBA in Business and Marketing. Patricia is the Executive Editor at the Journal of Diplomacy, a UN Digital Representative at the Center for UN and Global Governance Studies, an Abd El-Kader Fellow and the Director of International Affairs at the Graduate Diplomacy Council. She specializes in International Organizations and Global Negotiations & Conflict Management.